French Onion Soup | Have YOU Ben Starr Struck? This seems to be everyone’s favorite soup. 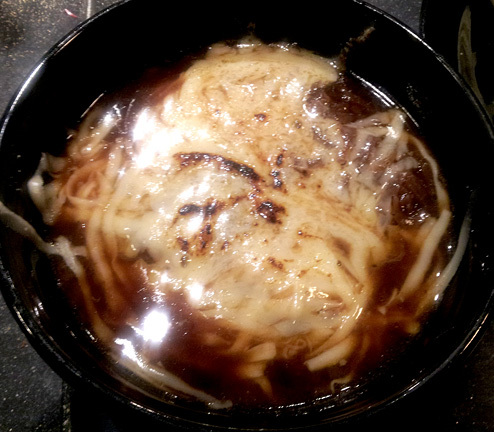 From the instant that I posted on Facebook and Twitter tonight that I was making French Onion Soup for dinner, I had over 20 requests for the recipe. Most of us don’t have the ability or the time to start with veal bones, roast them, and create a rich, dark, dense, grease-free stock to begin with. 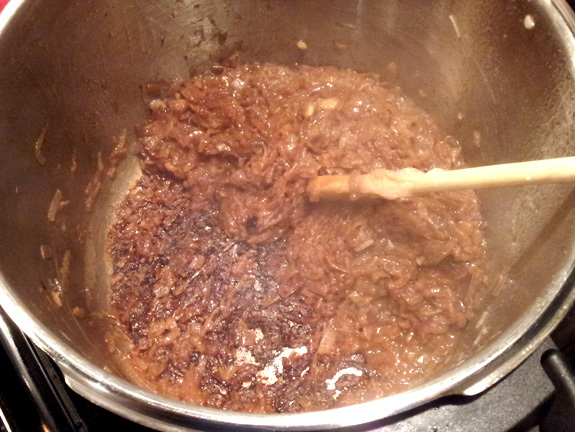 (The traditional starting point for an onion soup.) 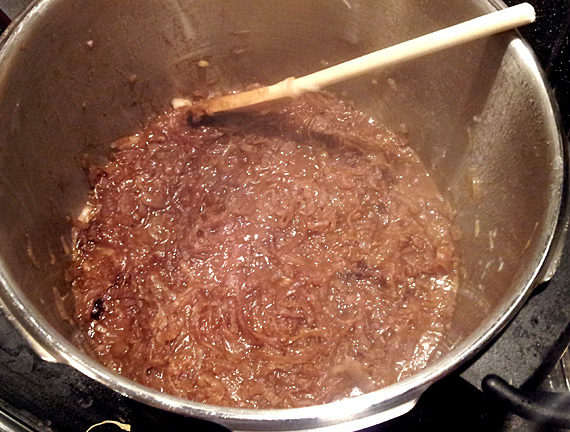 This recipe is the current distillation of my experimentation with onion soup over the years. Each time I make it, I tweak it a bit…but isn’t that was all passionate cooks do? This recipe is a compromise between convenience and traditionalism. I’m going to take my time caramelizing the onions, but I’m using prepackaged stock. This soup NEEDS salt. Don’t be alarmed if you are tasting and it’s still missing “something.” That something is salt. I have, in the past when making large batches, added UP TO 1/4 CUP of kosher salt. (Equivalent to 2 Tablespoons of table salt.) Add a bit, taste it. Swish your mouth out with water and taste again. Keep adding salt a heavy pinch or two at a time until it’s just right. The traditional presentation for onion soup in France is to ladle it over toasty croutons. I normally take a baguette and slice it thinly. Brush olive oil on the top, sprinkle with salt, pepper, dried basil and oregano, garlic and onion powder, and toast in the broiler until crisp. Then flip the slices, repeat with olive oil and seasonings, and sprinkle with shredded parmesan, and toast on that side. Then let them cool. These will keep for a day or two, you can make them ahead. Of course, the soup is also then traditionally capped with Gruyere or Emmenthal and broiled until it begins to toast. You can do this under the broiler, but then the bowls get SCREAMING hot and it takes the soup AGES to cool down to a temp that won’t burn your mouth. So I usually take my propane torch from the garage and melt and toast the cheese that way. This entry was posted in Recipes, Soups and tagged French. Bookmark the permalink. Ben, just made this for lunch. OHMYGARSH! Amazing. BTW, I have made your we page my default home on my iPad. I always come her first for recipes and dinner ideas. Your directions are excellent, and I have yet to flub up any of your recipes.